Sad news. More people are being killed in Boston, fewer people murder cases are being solved. Where are all the homicides happening? Check out the map. Boston Police posts crime statistics here. D14 is the district that includes Allston and Brighton. Through Novemeber 16 there were 2 homicides in our district. Most of Boston's homicides this year have been in Mattapan, Roxbury, Mission Hill, and Dorchester. Chicago Police use mapping technology to show where crimes are happening in their city. An even more interesting technology is ChicagoCrime.org. The crime mapping along a route of your choosing is very interesting. A report by the Boston Redevelopment Authority about the ownership and usage of tax exempt land in Boston. Last page is an interesting map of Boston showing the exempt land. 50% of the land in Boston is tax exempt. Most of that land is state (26%) or city (14%) owned. Colleges and universities own 1.5%, cemetaries own 2.6%, and museums and other cultural organizations own 1.4%. With major non-profit organizations Harvard and Boston University in the neighborhood, payments in lieu of taxes (PILOT) is a perennial issue of interest. The City Council held a hearing on Tuesday proposing that colleges and universities pay 25% of what their real estate taxes would be if they were not non-profits. If this formula were used, the 8 biggest schools would pay 16 times more than they do now. Will the schools really agree to pay so much more than they do under their current agreements? Did you know that most city employees at City Hall don't even have voice mail? Look at what New York City is doing! Many people in Allston rejoiced in February 2005 when Clear Channel Outdoor removed their billboards from this building at 298 Lincoln Street after their lease expired in January. So you can imagine our dissapointment nine months later to learn that the building owner wanted to put billboards back on top of the building. 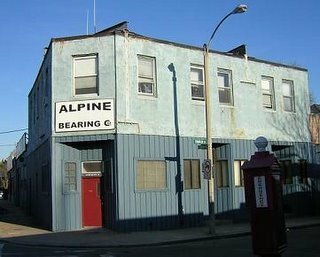 Inspectional Services DENIED a permit because Allston's zoning says: Any billboard except those in existence as of the effective date  of this Article, shall be forbidden. The building owner appealed this decision to Boston's Zoning Board of Appeals (ZBA). The Boston Redevelopment Authority reccomended denial of the appeal because billboards are a forbidden use, excessive, and would create a bad precedent in this residential neighborhood. Several Allston residents wrote letters opposing this appeal and Paul Berkeley attended the ZBA meeting to testify against it. But Allston's City Councilor Jerry McDermott and City Council President Michael Flaherty SUPPORTED constructing these billboards in our neigborhood and the Zoning Board APPROVED the appeal. So, soon Allston will have two more billboards than it does today. Allston certainly has its share of pedestrian dangers. Lincoln Street may be the worst. For anyone who goes to Artesani Playground or Herter Park or crosses the river from Allston to Cambridge or Watertown, this story in today's Globe is too true. ''We should not accept the status quo," Romney said in February 2003. ''Every park in Massachusetts should be world-class and the way to achieve this is to create a unified, world-class management system." State Representative Mike Moran of Brighton, who sometimes beseeches the city for help in cleaning graffiti on DCR-owned land in his district, said that years of inadequate funding preceded Romney. ''He wants to have a world-class parks system. Today we have a Third-World parks system," Moran said. ''I don't think Governor Romney understands how important these pools and rinks and recreation areas are for people that don't have them at their disposal down the street or in their backyard." It is great to see Boston's superintendent recognized as a Public Offical of the Year. Payzant is retiring in 2006 and his replacement will certainly be important to the future of Boston and the Boston Public Schools. Unfortunately it does not note any areas of strength for Massachusetts. I hope our government is better than that!